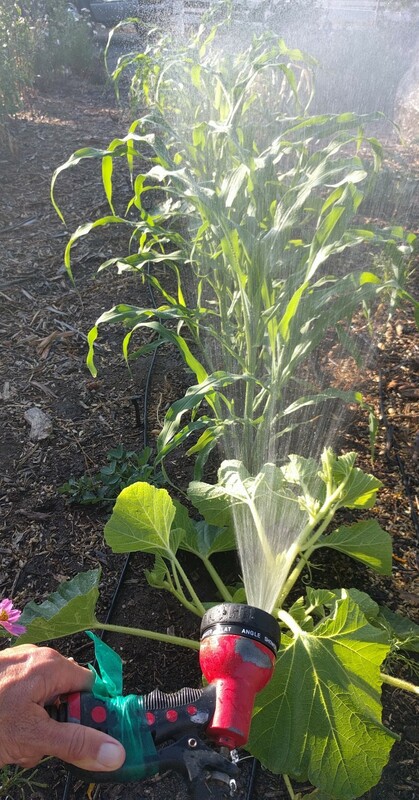 Drip irrigation supplemented by occasional overhead watering is the best way to water a vegetable garden. The best? That’s right. That’s my claim. This method gives you all of the advantages of drip irrigation while compensating for its few disadvantages. Here’s why, here’s how. Who am I? How do I know? I should know. I’ve tried every method of watering a vegetable garden. Long ago, I watered my vegetables with a cup and a bucket. Then I moved up to a watering can. Then a hose. I tried soaker hoses, I tried oscillating sprinklers, I tried spot sprinklers, I tried drip irrigation. 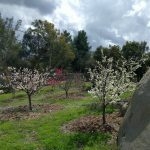 I’ve grown vegetables on flat ground, on steep slopes, and in raised beds. My aim has always been overall efficiency. I seek to use as little water as possible while still growing productive vegetable plants, and spending little time and money. That is the context in which I say that drip coupled with some overhead watering is the best. Why drip? 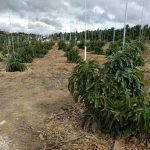 What are drip irrigation’s advantages? It was at the end of the summer of 2014 when I finally, reluctantly switched over to drip irrigation on all of my vegetables. I did so for a number of reasons. With drip, I could water at any time of day and didn’t have to consider wind or evaporative loss as I did with sprinklers. With drip, I could put the water where the plants’ roots were instead of also in the pathways between vegetable rows as inevitably happened with sprinklers. Look at all the dry ground to either side of that drip line. You can plant along the drip line and keep the path to the sides dry, saving water and money. 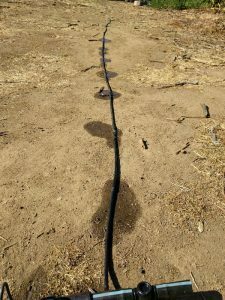 With drip, I could also know exactly how much water I was giving plants because the drip emitters had stated application rates (one gallon per hour, for example) whereas with soaker hoses or sprinklers this was difficult to assess. With drip, I could easily let a part of the vegetable garden dry out just by adding a shut-off valve to a line. This would be highly useful for crops like onions, garlic, and potatoes. 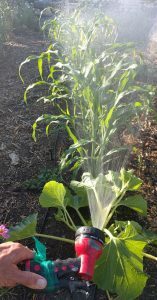 With drip, I didn’t have to worry about tall plants like corn blocking the sprinkler water from reaching other plants. And finally, with drip, there would no longer be dirt and debris splashing up onto my strawberries or the leaves of basil or lettuce. 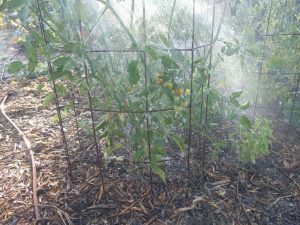 At the end of the next summer, after watering my vegetables with drip for a full year, I calculated that the changeover had reduced my water usage on the vegetable garden by about 50% compared to the sprinklers I had been using. That stunned me. Why not drip alone? 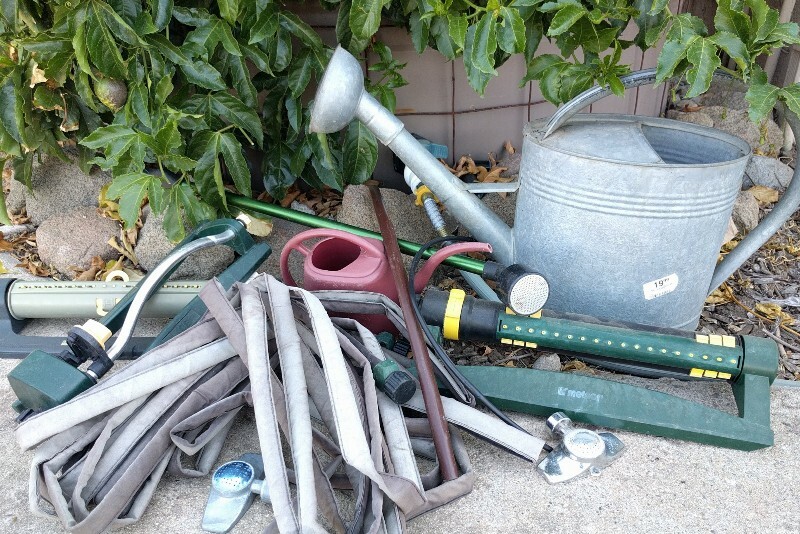 What are drip irrigation’s disadvantages? But all was not perfect in drip irrigation land. I noticed in the late summer and fall that some tomato plants were getting attacked by mites, and the foliage on squash and melon vines wasn’t the vibrant green that it could be. Here I credit Don Shor of the Davis Garden Show and Redwood Barn Nursery in Davis, California with clueing me in. Mites need a dusty leaf surface to proliferate. By late summer, my vegetables had gone months without any rainfall cleaning off their leaves. This was a downside to the drip irrigation applying water only at the soil surface. It wouldn’t be a downside in the winter when we in California get periodic rains, nor would it be an issue if I gardened in a climate with year-round precipitation. Shor recommended washing the foliage off every now and then by spraying it with a hose. I started that routine, and it has worked. 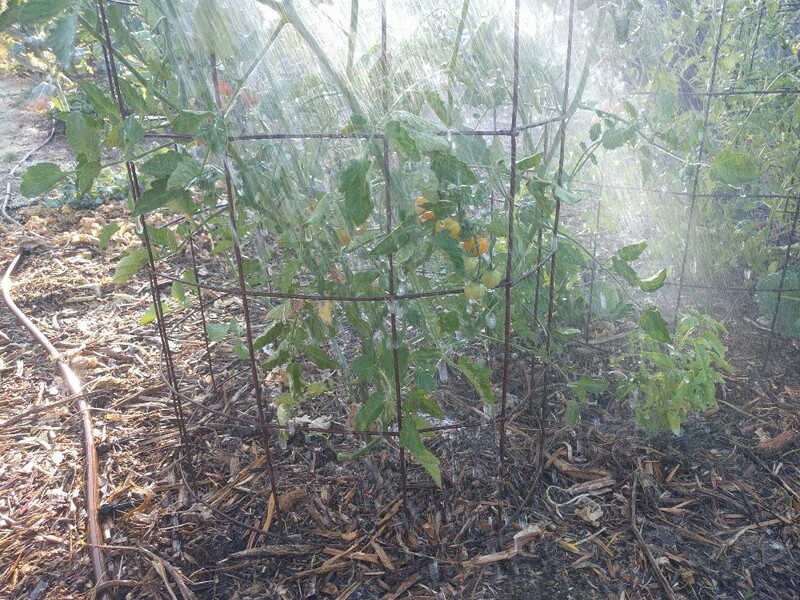 Raining down on Sungold tomato foliage to keep the mites away. A second weakness that I found with drip irrigation explained the lack of vegetative vigor in some of my plants during the summer. I fertilize my vegetable garden by spreading compost and wood-chip mulch on the surface. But drip emitters only wet a tiny portion of that surface. 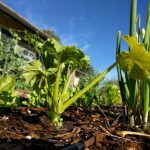 In order for microbes and other soil organisms to feed on and break down compost and wood chips — thereby making nutrients available to my vegetables — there needs to be moisture throughout. The entire surface of my vegetable garden got soaked during winter rains, but it dried completely by mid-summer, rendering the compost and wood chips inert and useless, essentially. Water it down like a good rain on occasion. Simple as that. That keeps the microbes and earthworms present, alive, and working. Sometimes the water that I spray on my vegetables to wash their foliage is enough, but sometimes I put a sprinkler out — like old times — and soak the entire area, paths and all. 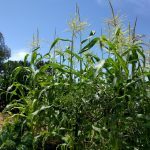 Corn is one vegetable plant that doesn’t seem to benefit from having its leaves washed off, in my experience, but it does love having moistened compost and mulch nearby to feed on. 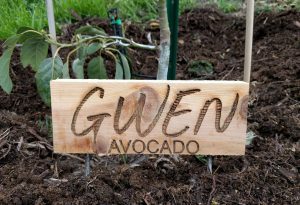 If you use any type of fertilizer that is applied to the soil surface, organic or inorganic, it needs to be watered in just like my compost and wood chips. 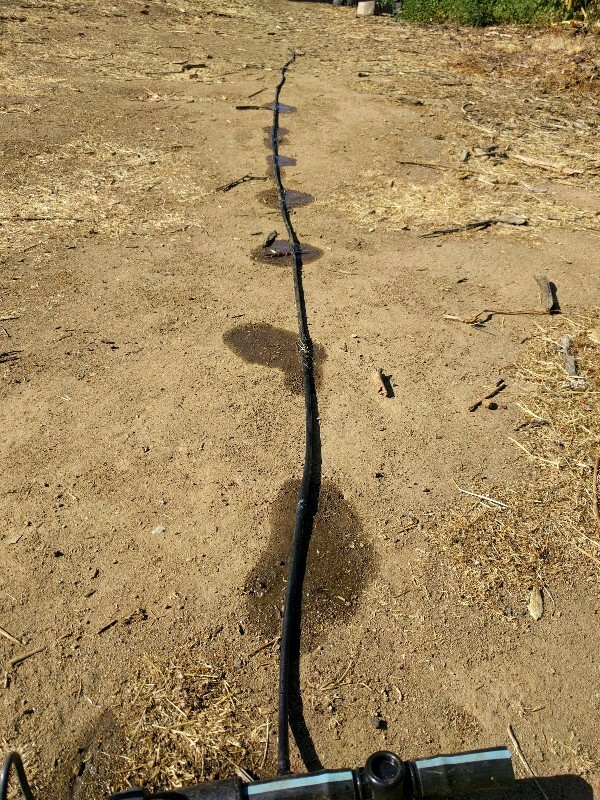 The only method of fertilization that doesn’t require such overhead watering is injectors connected to the irrigation system, which happens to be how most farmers fertilize if they use drip. Overhead water occasionally — how occasionally? For the past couple years, I’ve seen improved results in my vegetable garden by supplementing the drip irrigation with some form of overhead watering but I can’t give a precise frequency at which to break out the hose or the sprinkler because it depends on the weather and the thickness of compost or mulch on the soil surface. Once per month during the dry months (about April through November) has often been sufficient for me, but I spray or sprinkle more frequently sometimes. Anyway, here’s a fun metaphor to drive home with: Drip irrigation is the Prius you use for commuting Monday through Friday while overhead watering is the restored Volkswagen Beetle that you take out for a spin every couple Sundays. What is the best time of day to water your plants? I wonder if you ever tried plastic sheeting? I have not tried it, but I’ve seen tomato fields newly planted covered with black plastic. It seems that would hold the moisture at the roots. As far as I know, farmers use plastic sheeting for weed suppression and soil heating mostly, but the prevention of evaporation to some degree must be happening too, I’d assume. I’ve never used the plastic myself though.